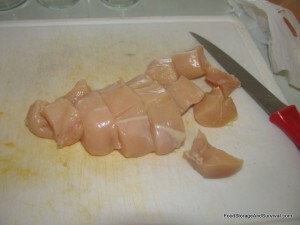 Want to know how to can chicken or pork? Well, you’ve come to the right place. Today we have a step by step, illustrated guide to canning pork and chicken! 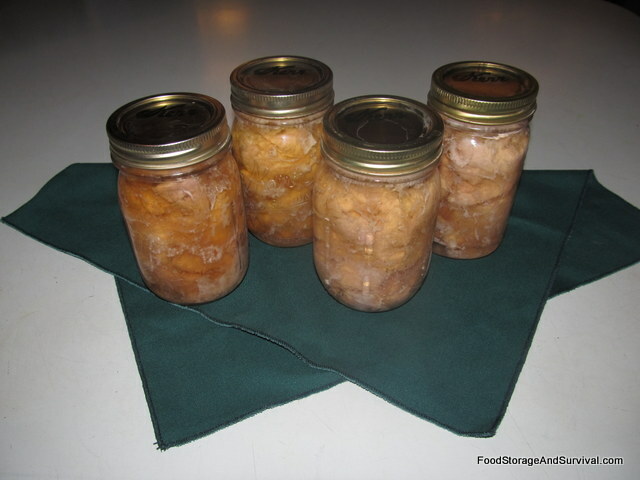 Canning meat might sound a little intimidating, but it is actually easier than many fruits or vegetables. Bottled meat is fully cooked when it is done processing, so it’s ready to use for a quick meal any time, plus it is shelf stable so you can use your freezer space for other things. If you can purchase chicken, pork, or other lean meat on sale, that is a great time to get some bottles full. You can also use meat from animals you butcher yourself. 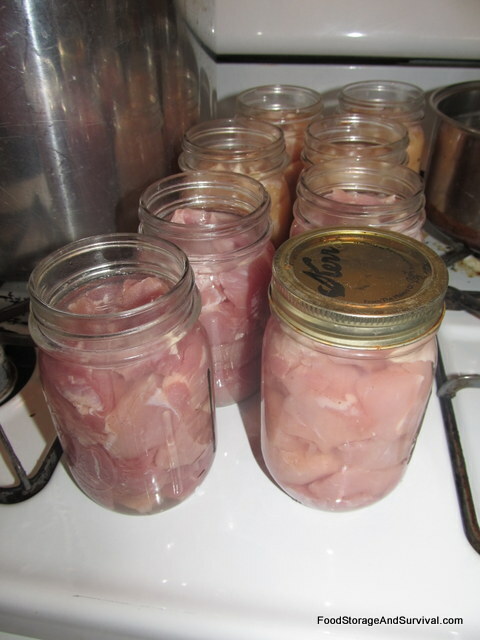 I’m canning pork and chicken today. I did keep them separated in the bottles so I ended up with bottles of chicken and bottles of pork. 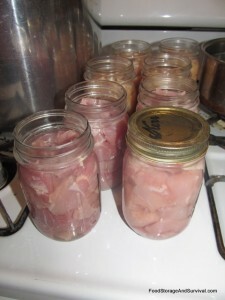 The instructions are the same for canning chicken and canning pork so I just put them together into one post and you can do either one or both. 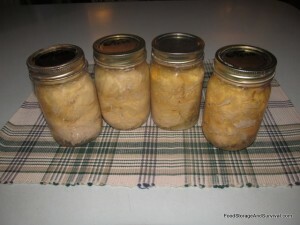 Pint or quart jars with rings and lids–I use pints. A pint jar holds approximately 1 lb of meat, which is just right for most soups, casseroles, etc. 1. Prepare your equipment. 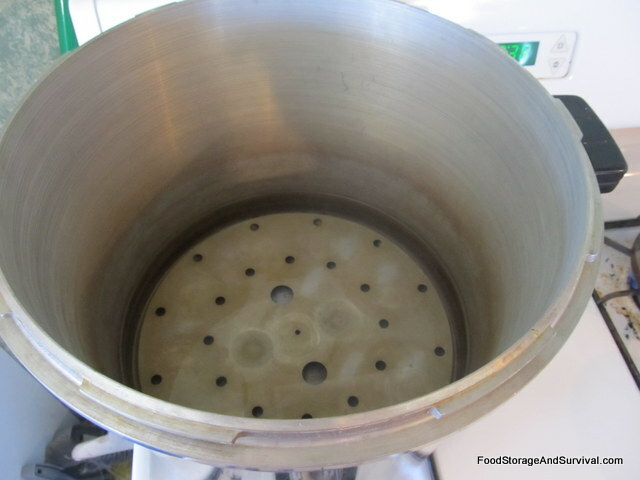 Put the jar rack and about 2-3 inches of water in the bottom of your pressure canner. 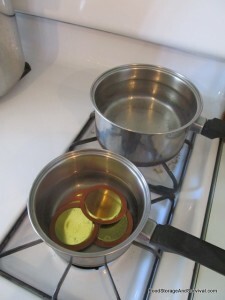 Heat some water or broth for adding to your jars. Heat the lids in a small pot of hot water. 2. Prepare your meat. 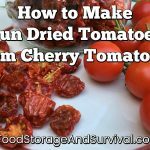 You can cut it into chunks, strips, or leave in large pieces that will fit in your jar. Trim off extra fat, gristle, etc. I like cubes about 1 to 1 1/2 inches square. Larger pieces might I had chicken breasts and a pork shoulder roast. You can brown your meat before packing it if you want. 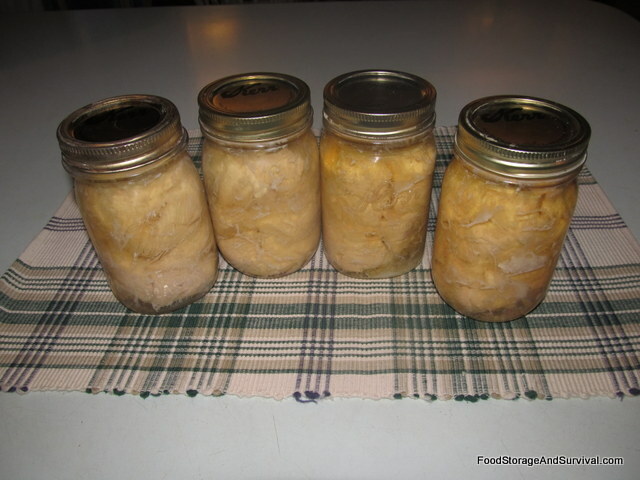 Chicken can be canned with the bone in–it falls off the bone nicely after canning. I am raw packing today, but I have also canned fully cooked meat using the same method. Processing times are the same. 3. 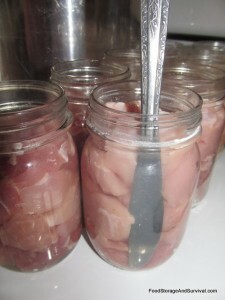 Pack the meat into the jars leaving 1 inch headspace. 4. Add 1/2 tsp salt per pint, 1 tsp per quart if desired. 5. Pour hot water over the meat and use a bubble freer or a butter knife to release the air bubbles. Meat tends to seal up against the side of the jar and trap a lot of air, so make sure you insert your knife at least four times in the jar and wiggle it a bit to get all the air out. Add more water to your jar if needed. 6. Wipe the rims of the jars and apply the lids and rings. 7. Process the jars. Put the jars in your canner, and put the lid on. Make sure you have the heat turned up. When steam starts coming out the vent pipe, place the weighted rocker on the vent pipe. Process at 10 lbs of pressure for 1 hour and 15 minutes for pints and 1 hour and 30 minutes for quarts. 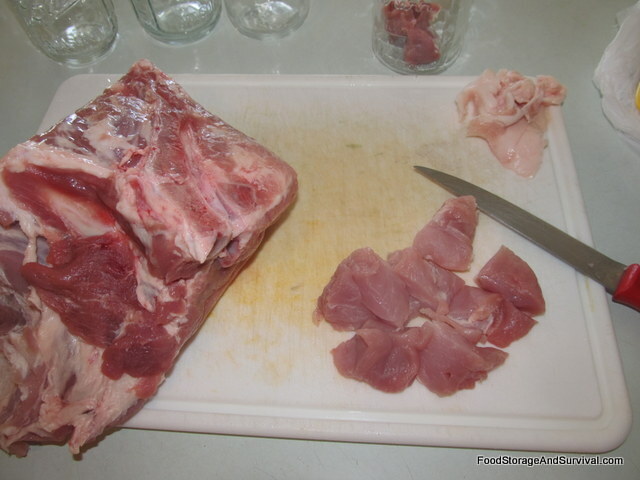 While it’s processing, clean your work area really well–that was raw chicken and pork you were working with! 8. 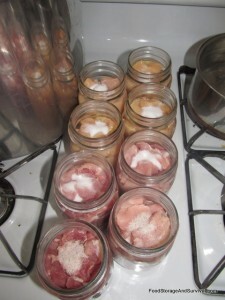 When the processing time is done, turn off the heat and allow the canner to cool, then remove the jars. Meat is one of the messier foods to can. You’ll probably want to wipe your jars off really well when you take them out of the canner (or wait for them to cool and then wipe them). 9. Once they’re cool, label them and you’ve got fully cooked shelf stable meat that’s ready to throw into your next casserole, burrito or enchilada, stir fry, soup or anything else you can think of! Enjoy! Canning meat instructions originally from the Ball Blue Book. What a great tutorial on canning meat. I can mine usually hot pack as I like the chunks to stay “chunkier” Is that a word? I would steer away from using a metal knife as it may scratch the inside of the jar that can cause a weak spot that can give way at the high pressures used in canning meat. When I can’t find my bubble freer I use a smooth bamboo chop stick. I keep it in my canner so I can always find it. Unlike my bubble freer. Thanks for the great tutorial and the always interesting blog. What if you don’t have a pressure cooker? Is there another way? No. You need a pressure canner to reach the higher internal temperatures that are needed to make low acid foods safe to eat. Hi just reading your blog on canning meat . My Mother used to can meat , chicken pork ect. and she never had a pressure cooker . How did she get away with it ? I have heard of folks doing this, but it is not safe. Botulism can survive the heat of a boiling water canner, so even though the jars would seal, if the meat had any botulism spores present on it, it would still have the possibility of making someone very sick or even killing them. My mom had a friend who did her green beans in a boiling water canner and just processed for hours instead of 20 minutes. It still can only get to a certain temperature, no matter how long you boil it. For safety, you do need a pressure canner for low acid foods. I know the cost of a persure cooker can be expensive, however, it is well worth the investment. Sometmes it is better to look at the payoff in the long run, of any investment rather than the cost. It was expensive for me not becasue I paid a lot for it but, because I am on unemployemt, so I clearly understand the cost factor. i just bought a pressure canner (used) but i noticed it doesn’t have a jar rack what should i use? You can lay down jar rings in the bottom of the canner or rig up any heat resistant contraption that will raise your jars off the bottom of the canner by about 1/2 inch or more. I use a rounf metal trivet, in my small PC. My grandmother wired up Mason jar rings for her large canner. I tried to can chicken, but towards the end of processing my house started smelling of boiling chicken and afterwards stunk up my entire house for days. Does this normally happen? How long could you store properly processed meat? I’ve canned everything else you could imagine, but never meat. It will keep three years or more in good storage conditions. i have a huge pork roast in the freezer. Can I defrost it and then can it after I’ve cut it up? Or should I cook it first, and then how long would I can it? 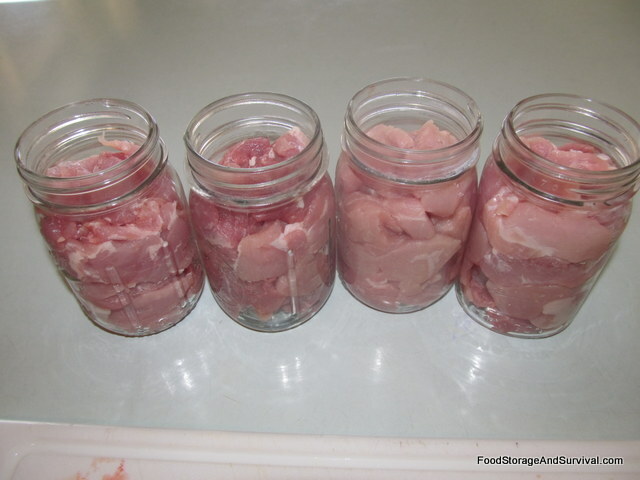 You need to can it the same amount of time whether it is raw or cooked when you pack it in the jars, so I’d just thaw it, cut it up, and do the raw pack as this post illustrates. Unless you’re planning to cook it and eat some for dinner, then can the rest (we’ve done this with turkey). The end product if the meat is pre-cooked looks a little nicer, but it doesn’t make as rich a broth in the jar either. What cuts of meats do you recommend? also, can you add aromatics to the jars (i/e: carrots, celery, onions, herbs, etc..)? Lean cuts are best. You’re trimming fat anyway, so it’s less work if they’re already fairly lean. Yes, you can add veggies or herbs to the jar. Yum! Thank you for the wonderful tutorials!!! 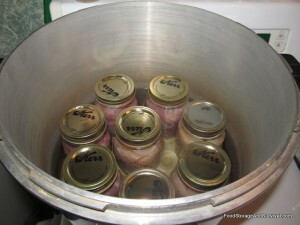 Can you stack pint jars in a big pressure cooker? If so, who to stack . Thank you!! If your pressure cooker is tall enough, you can stack them. Mine isn’t. A friend of mine used a rack like goes in the bottom of the canner on top of the first layer of jars and stacked the second layer on that and it worked great. I NOTICED THE MEAT LOOKED RAW PACKED .,DOESNT THAT CREATE ITS OWN JUICE DURING THE PRESSURE CANNING….IF YOU ADD ADDITIONAL LIQUID WONT THAT CAUSE THE CANS TO HAVE MORE LIQUID THAN THE CANNS CAN HOLD….